Girls Summer Uniform (left), Boys and Girls Winter Uniform (centre and right). The wearing of uniform is strongly encouraged. It is noticeable that children who come to school smartly dressed, looking ready for a good day’s school work, are more inclined to display the right sort of attitudes to behaviour and classroom studies. Uniform also helps to reinforce the feeling of school community. V-neck jumper/cardigan with school logo. Girls: Grey skirt, pinafore or school trousers. No leggings or jogger trousers. Boys: Grey or navy socks. Girls: Grey, navy or white school socks or tights. 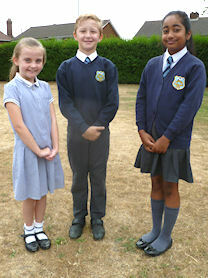 Note that all Junior children should have a proper school shirt and tie unless wearing a summer dress. A school shirt should still be worn with an open neck, or a checked blue school summer dress. Hair - Extreme styles are not allowed, including the following: short hair on side with longer hair on top; tramlines; braiding; dyed hair; spikey hair; mohicans; shaven heads; the use of gel or fashion hair; any other style that the Governors deem to be extreme. All long hair has to be tied back within the classroom environment due to health and safety. Shoes - Black sensible school shoes are required at all times when your child is in the building unless it has been agreed, due to a medical condition that a child can wear plain black short boots. Make-up - Nail varnish or make-up of any description are not allowed. Jewellery - Only small stud earrings may be worn. Note that all children from Year Reception to Year 6 should have a proper school shirt and tie unless wearing a school Summer dress. Based in Chasewater Park. Changing rooms; cards facility; local cafe/play area.